High blood pressure is a silent killer and often occurs in old group, but now it happens to young adults more. What causes hypertension in young men then? Blood pressure is a measure of the force with which the blood in our vessels hits the containing walls. This pressure is generated mainly by the pumping action of the heart, which forces the blood to the periphery. Hypertension is clinically referred to as a persistent increase in the blood pressure of an individual measured at two or more consecutive occasions by a professional healthcare provider. Hypertension is also known as a silent killer, since it leads to many other health issues and chronic disorders. It causes the heart to pump the blood harder, the vessel walls to become thicker (in order to sustain added pressure) and increase the risk of damage to the microvasculature, ultimately leading to the heart failure as well. Hypertension is clinically measured by taking the blood pressure readings under resting conditions. A normal value is usually considered to be 120/80 mm of Hg.120mm of Hg measures the pressure or activity of heart during the contraction phase – also known as systolic blood pressure. 80 mm of Hg is the normal reading for diastolic blood pressure and is taken when heart muscles are in relaxation mode. However, these readings are just for reference and may vary between different ethnicities, age groups and sexes. Pre-hypertension. A blood pressure reading between 80-89 (diastolic) and 120-139 (systolic). Stage I Hypertension. A blood pressure reading between 90-99 (diastolic) and 140-159 (systolic). Stage II Hypertension. A blood pressure reading above 100 mmHg (diastolic) and above 160 mmHg (systolic). 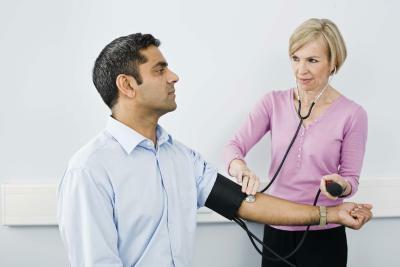 People in the age group of 60 and above have a blood pressure in the range of 150/90 or above. If your blood pressure is persistently above the normal suggested value, you must seek help from a registered healthcare professional to minimize the risk of complications. It is important to remember that besides young patients, a systolic blood pressure above 140 mm of Hg needs more medical attention as compared to persistent diastolic blood pressure. This is because systolic blood pressure suggests serious and life threatening pathology in the heart. High blood pressure often occurs in the old group, but it can also affect other groups like young people. Studies have shown that genetics may play a very significant role in the pathogenesis of hypertension. A positive family history of hypertension is invariably a strong factor that increases other family member’s risk of developing early vascular disorders. Although preventing hypertension is not possible, proper awareness and identification of risky traits can delay the onset of symptoms in the susceptible patients. For at-risk population, early prevention and strict monitoring of blood pressure can help with disease management. Diet high in sodium and fats can increase the chances of developing hypertension. In addition, individuals who consume high levels of alcohol or live a stressful lifestyle are more prone to experiencing much severe metabolic derangements. Likewise, obesity can add more stress on your heart and may increase the risks of early complications. Studies have indicated that African-Americans and Mexicans are at higher risk of suffering from hypertension because of higher rates of obesity and unhealthy dietary habits. Recently, the intensity, frequency and duration of various physical activities decrease significantly, which could be one of the causes of high blood pressure in young men. A lack of physical activity can be more disastrous for individuals who are at a risk of hypertension. This includes individuals with high body mass indices, genetic tendency, etc. For such individuals, an hour of daily physical activity is recommended to burn excessive fats and to enhance the body metabolism. Cigarettes contain thousands of harmful chemicals that may damage the respiratory system on chronic exposure. Nicotine can harden the arteries, narrow the internal diameter and make smokers prone to several health issues. Another component of cigarette is carbon monoxide, which displaces oxygen from the blood, and this process results in additional pressure for the heart to meet the oxygen demands of the body. Research suggests that premature birth can increase the risk of hypertension. This is primarily because premature babies have malformed circulatory system and blood vessel structure. Certain drugs such as birth control pills, amphetamine, cocaine and steroids can cause hypertension, especially with chronic use and high doses. Certain pathologies related to kidney can result in retaining excessive quantities of salts and other solutes, which will be one of the causes of high blood pressure in young men. These pathologies include stenosis of renal arteries, glomerulonephritis and certain infections. Damage to heart-related smaller vessels can lead to hypertension in many ways. If the arteries become narrow, obstructed or deposited with fatty material, the risk of blood flow obstruction may increase, which may culminate in hypertension. The primary step to take is to change your dietary habits and increase your rate of physical activities to reduce weight. Replace all high fat food materials with fruits and vegetables and low calories ingredients. Avoid salty foods as much as possible. Restrict your alcohol intake to whatever amount your doctor thinks is suitable for you to consume. Once diagnosed, your doctor will prescribe certain drugs that must be taken regularly so as to maintain your blood pressure. Sometimes these drugs can make you feel dizzy or sleepy. If you have such problems, talk to your doctor about a change in regimen. Knowing the causes of high blood pressure in young men could help anyone with the concern deal with it effectively. Even if you are not at risk of getting hypertension, certain changes in life style and adopting some practices can help prevent the high blood pressure. Increase physical activity. It is advisable to work out for at least 40 consecutive minutes every day to maintain a healthy heart. Avoid smoking, alcoholic drinks and excessive salt. Maintain a weight as per the international standards set for different ages and sexes. Include fresh fruits and vegetables in your diet as an alternative to fatty or salty food. Avoid anxiety and stress as much as possible.